A couple of weeks ago I met a knitting friend at the green market, where we wandered around, bought some stuff, and then sat and knit for a little while. She was going out of town and I had a busy week ahead so neither of us could buy much. It's always hard to resist the temptation to buy more than I can use, but I was proud of myself. I came away with a melon, five ears of corn, a beautiful bag of salad greens, a pint of pear tomatoes, a handful of beautiful heirlooms, and a pint of fresh edamame. I was thrilled to see the edamame; I'd never seen it before outside of the frozen bags I used to buy on a regular basis from the grocery store. "Look," I said to my friend as we sat down on a bench near the market. I held out the edamame. "They had fresh edamame. I had to grab some of that." I could tell she didn't want to dampen my enthusiasm, but her husband was a farm boy and she knows her produce. "You know," she said, "it's just soybeans." And I have to admit, I felt a little deflated, not to mention a little stupid. Of course I knew edamame was just soybeans, but I hadn't ever had access to it fresh before and I got carried away. But that didn't dampen my enjoyment of it. 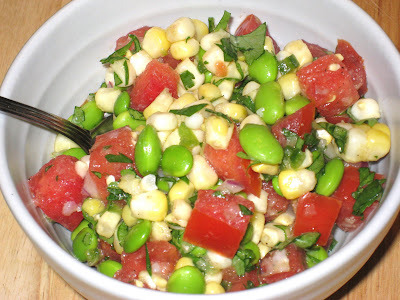 I cooked up the corn, chopped up some of the heirloom tomatoes, boiled the soybeans, and created this wonderfully delicious and refreshing salad. You can too. Place first five ingredients into mixing bowl. Add the rest of the ingredients and mix well. Chill for at least two hours. Let come to room temperature before serving.